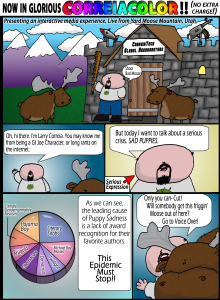 Sad Puppies 3: The Ensaddening. And for those of you interested in taking back fandom, here’s a message from someone way funnier than I am. It is that time of year again. If you’d like to nominate good books, stories, and related works for the Hugos so that the biggest award in sci-fi/fantasy isn’t just a Social Justice Warrior circle jerk, you need to get yourself a supporting membership to Sasquan before the end of January. Supporting memberships are $40. 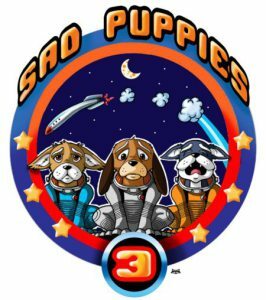 If you registered last year as part of Sad Puppies 2, you are still eligible to nominate this year. Because I’ve been swamped with Sons of the Black Sword and a new Warmachine novel, I’ve not had a chance to prepare any new Heart Felt Plea cartoons (and I am a remarkably slow and untalented artist) so let’s recycle some old ones! So please watch this very special commercial that we prepared last year, which in no way was ripped off of Sarah McLachlan’s sad puppy video. Just a quick update. I’ll be at CoSine 2015 in Colorado Springs this coming weekend. The convention will be held at the Hotel Elegante and it runs 23-25 January. There’s a lot going on for a relatively small convention, so if you’re in the area, I recommend checking it out. I’m excited for this convention because it has a good guest line-up and it looks like I’ll be on several interesting panels. Friday night I’ll be on Applying Modern Morals to Speculative Fiction with Connie Willis, Saturday at 1 pm I’ll be on Repercussions of Magic with Sarah Hoyt followed by Female Characters in F&SF at 4pm, and then Sunday at 2pm I’ll be on Research for Fiction Writers. I think they’ll all be fun panels. I’ll also be at the author signing on Saturday from around 5pm to 7pm both to sign books and if anyone wants to get paperback copies, I’ll have a few extra on me. I’ll preface this by saying that Interstellar is the best movie of 2014 that I nearly didn’t see. Why did I nearly decide to discount it? Well, the trailers did a terrible job of telling me what the movie was about. The trailers made it out (with me reading between the lines) that the movie was about how terrible mankind was that we had destroyed our only home and had to go to space to survive. Heavy on a message of doom and gloom and without any real ounce of hope, with the thought being we were destined to repeat the process as celestial locusts. This was not the type of movie I wanted to watch. Luckily, it wasn’t the movie I got to see. You see, Interstellar is nothing less than a movie about discovery, adventure, and exploration. The crew that goes to the stars in this movie are people chosen to do that most dangerous exercise: go someplace new and come back to tell everyone all about it. They are also the last, best hope for humanity’s survival, so no pressure. The movie has a slow, building pace where weight is added to every decision and the protagonists are struggling against that most certain enemy: time. The science of the movie is excellent as well. Yes, there are liberties taken, but there are also elements and plot twists taken from science and enough ‘what if’ that any science nerds will probably be on the edge of their seats. Visit a planet in close orbit around a black hole and have time dilation wipe out twenty three years in an hour. Also, get to see the tidal effects upon that lovely ocean planet, and that the woman sent ahead ten years ago died only minutes before your arrival, and just right after her own arrival. Playing with time is something this movie does incredibly well, along with hints and peeks not only at the movie’s plot, but also at the great potential to be found in humanity. Some of the best lines in the movie are about human nature and nature itself. At one point, the characters in space argue about what they might find being more or less dangerous than what they bring with them. Later on, they are both proven correct when one man is killed by the waves on the first planet they find and another is killed by a human scout sent ahead, who was willing to do anything necessary to ensure his own survival, even if it meant dooming billions of people back on Earth. 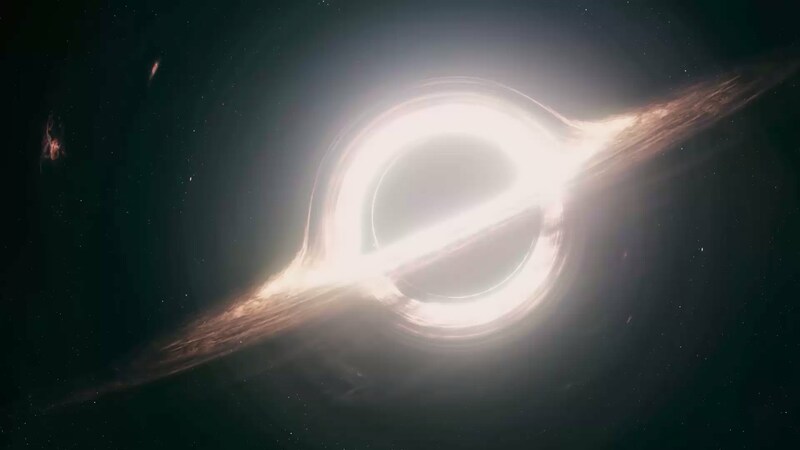 The movie manages to capture the stark beauty of space, with apparently scientifically accurate depictions of both black holes and wormholes (see this interesting article). And too, this movie does very well in capturing the spirit of exploration. The characters pause in wonder at the sights, caught up in the wonder and excitement of doing and seeing new things, and while they’ll take the time to mention the why or the how, that doesn’t rob the moment of it’s beauty. The characters are very much explorers, having little idea of what they’re going to discover, building upon what they learn and finding ways to use that knowledge to survive. They are forced to make decisions based off of their supplies and equipment as well as their limited amount of time. The weight of those decisions is upon them all and each choice they make is one that comes with a cost. The movie does have its faults, I’ll admit, and several of them are in the plot-driven variety. The voyage to the wormhole takes a meager two months, which is incredibly impressive given chemical-powered rockets. My assumption was that they used a nuclear powered drive and just didn’t want to discuss it in the movie. The ‘blight’ that seems to be affecting the crops is more of a mysterious force than anything else, though depictions of it as breathing nitrogen suggests either a very odd metabolism or just hand-wavium. Why this terrible stuff doesn’t follow the evacuees from Earth is another question I asked myself. Contamination is sort of a given for colonization and transportation. I mean, we can’t even stop rats from getting to remote islands, how can we stop an apparent super-microorganism that has adapted to attack all manner of food crops? Also, what did people eat if it killed everything else while they were waiting for their star ships over fifty-plus years? What the movie does very well is to get it’s point and message across with painful brutality. The ‘teacher’ at the beginning criticizing the pilot about believing in the moon landings. The quotes: “Man was born on Earth. It was never meant to die here.” and “We used to look up and wonder at our place in the stars, now we just look down and worry about our place in the dirt.” These are statements that paint a bleak (and unfortunately accurate) picture. We don’t look up at the stars with hope. Too many people are far more concerned with ‘fixing’ problems here rather than expanding out there. There will come a day that we are forced to choose between staying here and dying and going out to the stars and surviving. Overall, I thoroughly enjoyed the movie and I highly recommend it. It’s a great movie, with gorgeous effects, a powerful theme, and a spirit of wonder that still gets me excited thinking about it. 2015 is here, and boy is it busy already. Production continues on the audiobooks for The Shattered Empire and Renegades: Origins. I’m continuing work on Wrath of the Usurper and plan to have it done and the first version out to my alpha readers by the end of the month. I’ve got The Prodigal Emperor outlined and I’m outlining Renegades: Out of the Cold in my free time. If everything goes to plan, I’ll begin samples/snippets of Wrath of the Usurper sometime in February, followed by samples of The Prodigal Emperor. I’m really excited to be working on both books and I can’t wait to get them ready and finished for publishing. I can tell already that 2015 has the potential to be a great year and I’m starting it off with lots of projects. I’ll be attending Cosine here in Colorado Springs from 23-25 January. I’m excited to be participating in another local convention and this one looks like it’ll be a lot of fun. Check here for the website. That’s all for now, check back soon for reviews on some movies and some other content! Happy New Year to everyone! May this new year bring you all good fortune and success, and if it doesn’t do that, well, I hope everyone has a good time! I wanted to say thanks, in addition, to all my readers. The fact that you enjoy what I write makes me want to write more. Being an independent author means I don’t get a big advance from a big publisher, I get the royalties from you all, which means a lot more to me in a number of ways. 2015 brings a lot of changes for me. I’ve left active duty and I’m looking for a civilian job. What that means for my readers is I’ll have a bit more time to write. What it means for me is that I get more time with my family and a little bit more predictability (I hope) in my schedule. I haven’t worked in the civilian sector since 2005, so I’m certain this will be a an interesting transition for me. Goodbye 2014 and welcome to 2015!